This link will direct you to an external website that may have different content and privacy policies from Data.gov. Save the Date…the National Day of Civic Hacking is Coming June 6! I’m excited to let you know about the third annual National Day of Civic Hacking, coming June 6, 2015, to a city near you! It’s a day when we’ll collaboratively build new solutions using publicly-released data, technology, and design processes to improve our communities and the governments that serve them. Anyone can participate…you don’t have to be an expert in technology; you just have to care about your neighborhood and community. Lots of communities have existing frameworks for civic hacking events: events that provide opportunities for anyone who’s interested to collaborate to create services, apps, and websites that address social and civic issues that run the gamut from the environment to public accessibility to transit and housing. The National Day of Civic Hacking is a chance to connect and lift up these efforts to acknowledge the incredible impact that community collaboration, engagement, and volunteerism can have in our towns and cities. 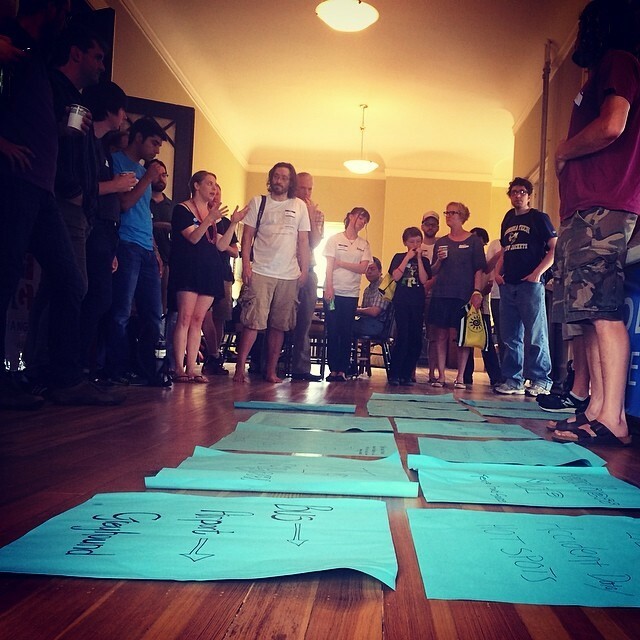 Participants gather at a civic hacking event in Asheville, NC last year. (Photo credit: Nick Skytland/NASA). I have to admit: this is one of those events that I just love. It brings together thousands of technologists, entrepreneurs, developers, designers, makers, organizers, scientists, and other citizens to improve their communities and the governments that represent them. Climate. Bringing together extensive open data and design to develop data-driven planning and resilience tools for local communities. Disaster response. Leveraging government data and digital networks in support of disaster response and relief. Economic Development. Redesigning how workers, entrepreneurs, and businesses interacting with local government can foster the kind of growth that a whole community can participate in. Health. Building technology that puts the user first to make it easier and more affordable to feed, shelter, and treat those in need. Oceans. Providing real-time information to work smarter and more safely as we commit to address the challenges facing our oceans. Safety and Justice. Getting the right information to the right person at the right time in the right way to make our communities safer and more just. The National Day of Civic Hacking is organized by Code for America with coordination from NASA and SecondMuse, as well as additional support from the White House Office of Science and Technology Policy (OSTP) and other Federal, state, and local agencies. I encourage you to pencil in June 6 as the day that you’re going to roll up your sleeves and get involved to move us from data and ideas to action, developing technology that will make the world a better place. Make sure to tell your friends, colleagues, and neighbors. I can’t wait to see the impact that we will have together! P.S. And don’t forget to share your thoughts, stories, and ideas at #HackForChange! DJ Patil is Chief Data Scientist and Deputy Chief Technology Officer for Data Policy at the White House Office of Science and Technology Policy. Thank you for the article. I will investigate locally and spread the idea.